All references of orientation are standardised as follows: The front of the bow is where the head is located, the back is where the frog is located. A bow held upright will have the stick at the top and the frog and hair at the bottom. 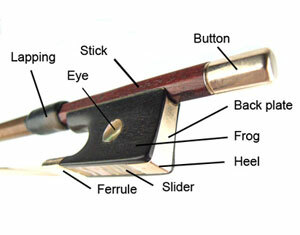 The left and right sides of the bow are also referred to as thumb and finger sides respectively. The mechanism used to tighten the bow hair. Turning the adjuster tightens the screw located in the cavity of the bow stick. The screw is attached to the frog, which pulls the hair tight. Decorative button, usually made of ivory. Knob at the back of the stick, attached to the adjuster to enable tightening of the bow hair. The bevelled edge connecting the back sides of the head. On Cramer and earlier style heads, there is little or no chamfer. A round decorative inset found at the sides of the frog, often made of mother of pearl. Decorative insets found on some buttons, usually made of mother of pearl. A general term used for the non-stick parts of the bow. The block of wood, ivory, ebony designed to hold the bow hair to the stick. The part of the stick, at the back of the bow, which the player holds when playing. See item 10.13. From the 1770s, François Xavier Tourte and his younger brother Léonard Tourte began developing the forerunner of the modern style head shape, known as the Cramer bow. A late 18th-century design, transitional between the Baroque, pike style and Cramer style head. See 10.1. A band of leather, wound silver wire, or whalebone that covers the bow stick in the frog area, designed to protect the stick from wear and assist the player’s grip. 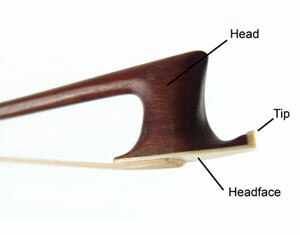 A cavity cut into the stick wood found on the head and frog, into which the bow hair is secured by a wedge. A type of decoration found on the frog, consisting of an eye surrounded by small ring bands, often of gold. The main part of the bow, made of wood and often cambered and shaped. Stick profiles can be fluted (usually early 18th Century and before), octagonal (along the whole stick or just above the frog to facilitate an easy fixture to the wood), or round.